Who’s in the mood to take care of the lawn anyway? Mowing the lawn is not as fun as it appears in the movies. Especially if it is summer with gazillion degrees outside and humidity that reminds you of amazon’s tropical forest. Last time that you checked your lawn out of your windows was when you were trying to find your jack russell. You opened the window and started searching for your little dog but there was no luck. The grass was so tall from the automatic watering, that the only thing missing was Tarzan. You had already cheetah. At some point you notice a small grey head fadedly appearing once in a while. It is actually your dog jumping, trying to find its way back to the house. You realized that it was time for you to take care of this little tropical forest which has developed over the course of the year. Since you are in no mood to do it yourself, Viking has thought about you. Well, not specifically you, but let’s say “your kind” of people. 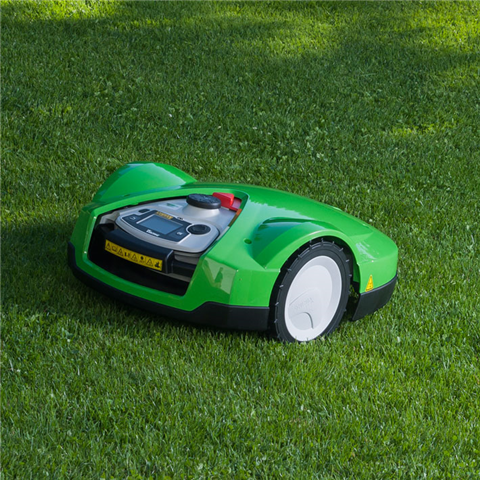 It simply brings you the robotic iMow, the smartest lawn mower you have ever seen. It’s iMow, not I moo.. Sounds like the sound of the cow when craving for grass. It is something similar. It craves for your Grass. The iMow is a robotic law mower which operates completely automatically. And when I say completely, I mean that you do not have to put any effort even when the iMow needs to be charged. It is the lawn mower you could have seen only in movies and now it can actually be yours. All you have to do is program the iMow and once done, it starts doing all the work by itself. It is capable of avoiding obstacles on its way as well as climb small hills. But its not only that. Once its finished mowing your jungle or when the battery is about to die, it returns back to the docking station without you doing anything. I know its bad news for your gardener but you need to let them know that they have to find another lawn to mow. My dear Gardener, you’re fired. Wrap the iMow up! The iMow is directly available from Viking’s website and it is priced at £1,990.00. Not bad at all, considering the fact that so far someone else was doing it for you for a wage or maybe you weren’t doing it at all (well in that case it is expensive right?). Either way, it is a very smart investment to keep your lawn tidy and human friendly. And who knows, maybe next time no apes are going to inhabit your home. Did you like the automatic mowing? You are definitely going to like the automatic plant watering as well. You really like smart devices don’t you? Why don’t you check out Vessyl, the smartest mug you have ever seen? Maybe you can also afford the best jet ski ever designed to ride it right after you mow your Castle’s lawn.